The viper (Viperidae) is a family of more than 200 species of venomous snakes. Vipers are distinguishable by their long, hinged fangs that allow a deep perforation of venom into their prey. There are four subfamilies of viper snakes -- Fea's vipers (Azemiopinae), night adders (Causinae), pit vipers (Crotalinae) and true or pitless vipers (Viperinae). The viper has two hollow fangs at the front of its mouth, connected to a rotating maxillary bone. This allows the fangs to tuck back toward the roof of the mouth when not needed. While there, they are surrounded by a membranous casing. The individual fangs can rotate in conjunction with each other or separately. The snake can open its mouth almost 180 degrees to strike its prey. The fangs rotate at the last moment to avoid damage. When striking in self-defense, the snake is able to administer a dry bite without any venom. Most vipers have vertically oval-shaped pupils that can vary greatly in size, from being open wide to almost shut. This allows the snake to see in an extensive range of light levels. Almost all vipers have keeled scales, meaning their scales are ridged, not smooth. They are thick in build and have a short tail. The viper's venom-producing glands are toward the back of the upper jaw, causing the viper to have a triangular-shaped head, distinguishable from the neck. Most give birth to live young, although some lay eggs. Vipers exist in all parts of the world except Antarctica, Australia, Ireland, New Zealand, Madagascar, Hawaii and some solitary islands above the Arctic Circle. In the UK, the only venomous snake is the adder. The viper is able to decide how much venom it injects. The snake bases this on the size and species of its prey and whether or not it intends to keep the prey. Each type of viper has distinguishing characteristics such as head shape, strength, active time, and size. Generally vipers eat rodents, small birds, lizards, frogs and other small animals common to their region. How they find and attack their prey is different depending on which subfamily the viper belongs to. Considered the most primitive of vipers, the Fea's Viper has shorter fangs than those of other subfamilies and a somewhat flattened head. These snakes inhabit Myanmar, southeastern Tibet, southern China and northern Vietnam. Only found in sub-Saharan Africa, unlike the name suggests the night adders are in fact active during the day and night. They are able to lift the front of their bodies above the ground in a coil, to lash out at prey. 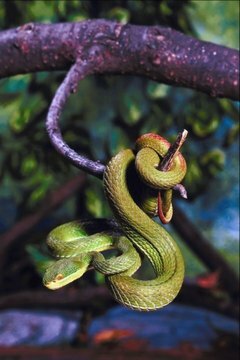 Pit vipers derive their name from a heat-sensitive pit organ on both sides of the head, between the nostril and eye. This allows them to track prey through infrared radiation images. These vipers are larger than those from other subfamilies, reaching a maximum length of more than 6.5 feet. They inhabit Europe, Asia, Africa and the Arctic Circle.